Nature walk in Horton Plains National Park, which is approximately 10,000 Hectares in extent, is haunted by Elk, Deer, Giant Squirrel, Wild Boar, Wild Hare , Porcupine, and a variety of Migratory birds, unique to this region. According to a recent count there are 16 Leopards in Horton Plains. If you are very lucky you may get a glimpse of a Leopard during your sojourn in the Horton Plains. Take pictures at these locations to take your memories home. Most of the day both small and big “World’s Ends” are covered with mist and clouds. So, one must have patience to wait at these points for clouds to clear up to get a glimpse of a steep drop and a tea estate beneath World’s End. The big World’s End has a sheer drop of 3700 feet. 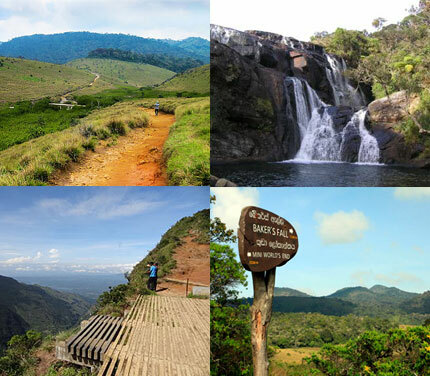 Guided trekking trails inside Horton Plains.